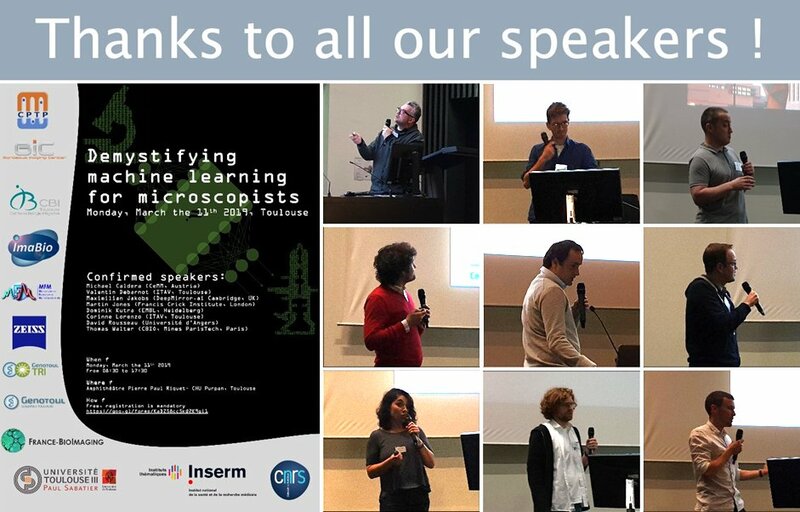 On the 11th of March, both the Bordeaux and Toulouse Imaging Facilities have been collaborating to organize a mini-symposium dedicated to machine learning. Artificial intelligence, machine learning, deep learning are terms that are more and more employed, but what do they really mean ? More than 130 participants from all over France came to Toulouse with those questions in mind, looking for answers. Thanks to our 9 international speakers, we have been able to get a grasp at the hidden meaning of those (not so) new methods, how to apply them to microscopy data and what are their specific drawbacks. A more private event took place on March the 12th: thanks to Dominik Kutra, developer of the ilastik software, 16 Facility Staffs have been trained to this fantastic software, easing the process of image segmentation using the Random Forest approach (amongst others). During this “train the trainers” session, 12 of our colleagues from all over France were able to follow along, remotely. By the way, if you’re asking yourself how the enclosed image was generated, have a look at the imageJ plugin “FigureJ”.